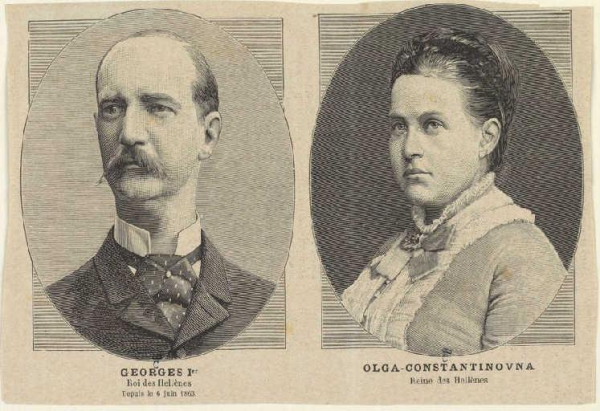 Athens, Oct. 27 -- Twenty-five years ago, King George  and the Grand Duchess Olga , eldest daughter of Grand Duke Constantine of Russia , were married, and their silver wedding was celebrated today. The occasion was marked with no great pomp, though the day was observed as a general holiday throughout the country. Athens was thronged with a large number of people from all the nearby rural districts, many of whom have been in the city for several days awaiting the fêtes. Among the first of the royal guests to arrive was the tsarevich , who has been here since Sunday. Prince George of Greece , who traveled with the tsarevich on his recent tour of the world, and who intervened to protect the heir to the throne of Russia from the attack made upon him by a crazy policeman in Japan, went to Corinth to meet him, and together they returned to Athens. Prince Frederick, Crown Prince of Denmark , and Prince Karl , his son, landed at the Piraeus yesterday. A prominent feature at the Piraeus was the arrival of the French Mediterranean squadron and its admission to free pratique. On Tuesday, a number of the French officers came to Athens and took dinner with the King at the palace. Tonight the war ships were illuminated in honor of the anniversary. The King and Queen gave a prolonged reception yesterday to the various diplomats, who presented autograph congratulations from the heads of their respective governments. This morning, the King and Queen and their guests drove to the cathedral, where a Te Deum was sung. As the royal party passed through the streets from the palace to the cathedral, they were given a most hearty reception by the crowds on the streets. The houses were handsomely decorated, and designs were displayed on which were inscribed congratulations and wishes for the welfare of the royal couple. The ceremonies at the cathedral were solemnly impressive. Upon their conclusion the people who thronged the structure broke out into cheers for the King and Queen. The cheering was taken up by the crowds outside and was carried along to the palace by the people who lined the entire route. As the royal party were driven back to the palace, King George and Queen Olga were again made the recipients of a grand demonstration. This afternoon, the King and Queen left Athens for Dekeleia, the royal estate on the slopes of Mount Parnassus. They will remain there until Saturday, when they will return to preside over the state banquet that will be given at the palace. One hundred sixty-five guests have been invited to attend this banquet. The city is brilliantly illuminated tonight. It will also be illuminated tomorrow and Saturday nights. 1. King George I of the Hellenes (1845-1913) was Prince William of Denmark before the Greeks elected him to be their monarch in 1863. He was assassinated shortly before his planned Golden Jubilee celebrations. 2. 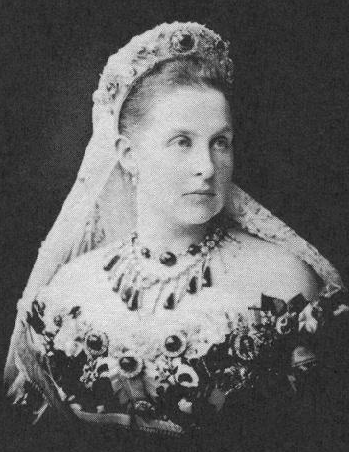 Queen Olga of the Hellenes (1851-1926), was born Grand Duchess Olga Constantinovna of Russia. 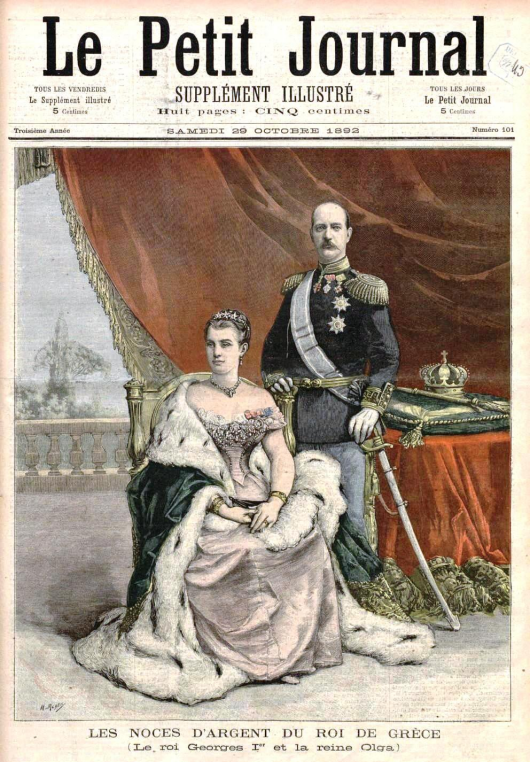 She married the newly-elected King George of the Hellenes in 1867. She lived through the assassination of her husband, World War I, the Russian Revolution of 1917, and two Greek royal exiles. 3. Grand Duke Constantine Nikolaievich of Russia (1827-1892) was Queen Olga's father; he died a few months before the silver anniversary. He was a younger son of Tsar Nicholas I of Russia, the brother of Tsar Alexander II, and the uncle of Tsar Alexander III. He married Princess Alexandra of Saxe-Altenburg, Olga's mother, in 1848. 4. Tsar Nicholas II of Russia (1868-1918) was still the Russian crown prince, or tsarevich, in 1892. He was related to both King George (who was his uncle) and Queen Olga (who was his cousin). 5. Prince George of Greece and Denmark (1869-1957) was King George and Queen Olga's second son. He did indeed save Nicholas's life during an assassination in Japan. He later married Princess Marie Bonaparte; he also had a complicated, life-long relationship with his uncle, Prince Valdemar of Denmark. 6. King Frederik VIII of Denmark (1843-1912) was Crown Prince Frederik of Denmark in 1892; he became Denmark's king in 1906. He was King George's elder brother. 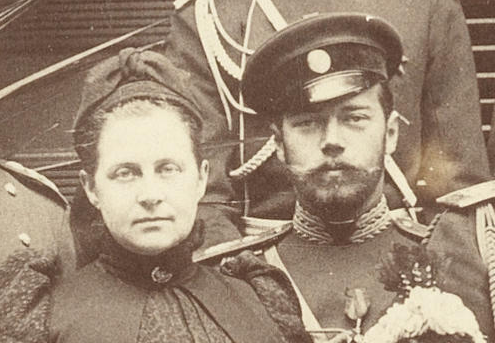 Their other siblings included Queen Alexandra of the United Kingdom and Empress Marie Feodorovna of Russia. 7. Prince Carl of Denmark (1872-1957) was Frederik's second son. He married Princess Maud of Wales, the daughter of his aunt, Queen Alexandra of the United Kingdom, in 1896; nine years later, he was elected the king of Norway. He reigned as King Haakon VIII of Norway for more than 50 years.